I really wanted to get into the right mindset for returning to Alaska. I’d even checked out a copy of Richard Proenneke’s “One Man’s Wilderness” and read it cover-to-cover before we did the trip. The weather cooperated perfectly the whole time we were there. Blue skies, cool temperatures outside of the city – it felt more like spring or early fall rather than June. It’s mind-boggling, almost, to realize just how big Alaska’s national parks and nature preserves are – some of them, like Chugach and Kenai, take several hours to drive through. We’re not talking about a tiny speck of green space here, people. We’re talking parks with a capital P.
But Alaska’s a big place – it’s the biggest state in the U.S., and don’t you ever forget it, Texas – so it’s only fitting that it should have huge tracts of absolutely gorgeous scenery – mountains, birch trees, rivers and huge patches of lupine in full bloom. So, getting to Eagle River. You take Glenn Highway out of downtown Anchorage and the suburbs, and that will eventually connect you to Eagle River Road up into the mountains. Mind you, if you’re going in the summer and there’s construction going on, it’s going to take a while to get through Eagle River Road. The nature center land has about 10 miles of hiking trails going through it, including a section of the Historic Iditarod Trail. The shorter trails include the Albert Loop, Dew Mound, Crow Pass and the Rodak Nature Trail – which we did for our first visit at Eagle River, as a way of getting warmed up. For overnight hikes and stays, there are cabins and yurts available for rental. Rodak is a nice easy loop hike that takes you down along some wildlife viewing platforms – one for beaver, one for salmon. This is the hike where you’ll be seeing the families with dogs and young kids going out for an amble – and there were plenty out there that day. You’ll see signs along the trail telling you about the natural history, geology and wildlife. Bear notice on the signboard at the nature center headquarters. 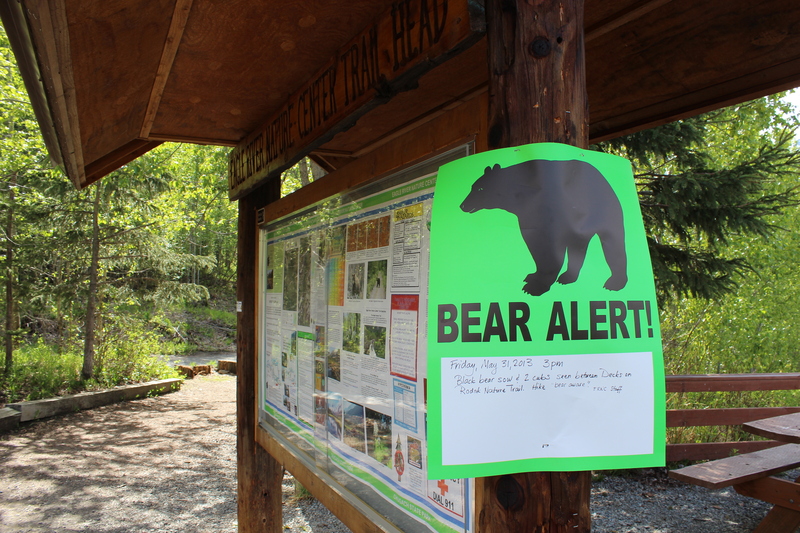 There was a notice on the signboard that a black bear sow and her cubs had been sighted in the area recently, so we saw a few hikers carrying some “bear bells” or packing a can of bear spray. The only bears we saw that day were the two bear pelts (one black, one grizzly) on display in the nature center – each one sporting a really impressive set of ursine dental work. Came back later on in the week to take on a bit of the Iditarod Trail. The original plan had been to take on the Albert Loop, but the staff at the nature center warned us that the trail was impassible at the moment due to flooding. In fact, it does say on the map that the section of the Albert Loop down along Eagle River does get a little soggy in the summer. This is not part of the route for the Iditarod dogsled race, mind you. This is the original trail from Seward to Nome from 1888 to 1923. It fell out of use after that time, but over the last few decades it has been restored as a long distance trail. The section that runs through Eagle River is about moderate in difficulty, with some uphill climbs over rocks, and some occasionally swampy bits. We did an out-and-back-hike from the nature center headquarters to Rapids Camp with not much trouble. But if you’re going to do a longer stretch, it helps if you have some hiking experience behind you. I’d gotten a calf muscle cramp – you know what it’s like, one of those dull aches you get while you’re sleeping, followed by a screaming, tearing pain – earlier in the morning, so I had to take my walking kind of slowly at first. But after a few minutes, I was walking normally again. The trail eventually brought us down to the area of Rapids Camp, where the trail takes a bend to the north and continues up along the banks of the river. But there is a smaller side trail that takes you right down to the river bank. Made our way down to the river edge. Stepped out onto some rocks in the river shallows, and there we were treated to the “money shot:” a National Geographic-worthy view of the mountains and birches towering over the river. I could use the usual clichéd words like awesome, breath-taking or awe-inspiring, but it wouldn’t have done the place justice. But it felt like this was the essence of the Alaska (summer) backcountry, right there in one spot. And so I’ll just let this one photo do all the talking for me. 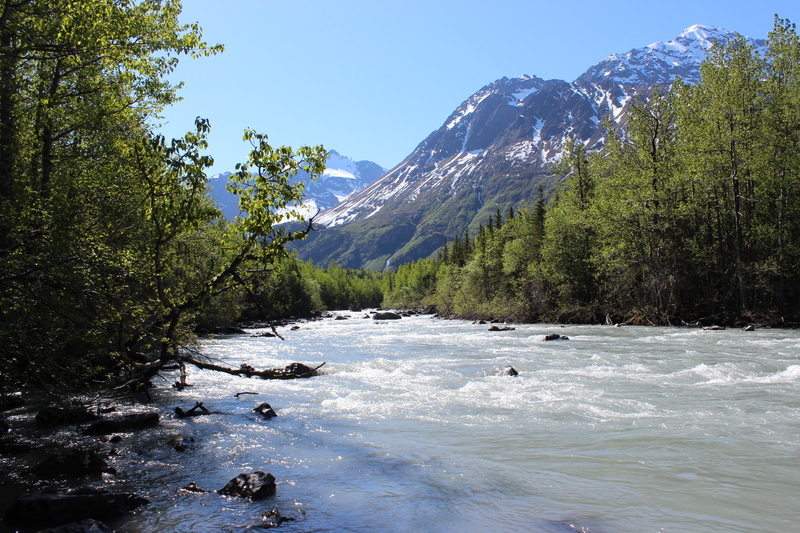 The Eagle River, as seen from Rapids Camp.